Stunning home in Shipyard Plantation w/a private pool! Whether you are looking for the perfect permanent residence or second home that can help pay for itself, this is it. This spacious 5 BR 3-+ BA home was designed for permanent living & makes your vacation guest feel at home, wanting to come back! There are 2 master suites, one on the 1st floor. The kitchen has a center Island & granite counter tops. The Carolina room & living room overlook the beautiful pool and 1st tee of The Galleon Course. Home has been meticulously maintained & refurbished over the past several years; new ACs (2015, 2017), kitchen, windows, roof, pool equipment & more. Immaculate 3 BR/3.5 BA featuring spacious living room w/ fireplace, custom bookcases, cathedral ceilings & new quality furnishings & accessories throughout the Villa. Family room/kitchen combination is a great place for the family to enjoy cooking & family recreation. The kitchen features granite countertops, custom cabinetry, an eat-in breakfast area overlooking a private spacious deck. Half Bath on main floor. Three spacious bedrooms with en suite baths makes it perfect for a private setting. Outdoor storage for beach furnishings. Great Investment Property. Grossed over $32,000 in rental revenue for 2018. One of the closest Beachwalk townhomes to the beach! This warm 2 BR, 2.5 BA townhouse with lots of natural light could be the right fit for you. Start the day bathing in sunlight in the breakfast nook with high windows or on the back deck. 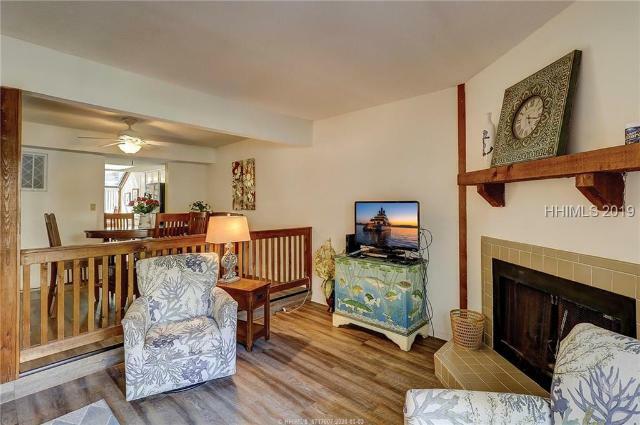 Enjoy evenings by the living room fireplace. This is open concept living with an easy flow between kitchen/dining/living areas. Large bedrooms are perfect of hosting family and friends. A great primary or second home. Shipyard yard is an ocean front gated community with amenities including beach access, 3 golf courses, community tennis, leisure trails, and more! LOCATION LOCATION LOCATION! Check out this 2 BR, 2.5 bath Beachwalk townhouse on Hilton Head Island. ItGÇÖs fully furnished and move in ready. Beachwalk is the closest community to the beach in Shipyard Plantation. First floor features include a galley style kitchen with breakfast nook and tall windows. An open floor plan living and dining room combination with fireplace are great for entertaining. Sliding glass doors flow out to a large rear deck with separate grilling area. Upstairs are 2 large bedrooms with en suite baths, and lots of closet space. This villa has smooth ceilings, 2nd floor laundry, multi zone heating and cooling. This spacious top floor 2 BR, 2 BA Colonnade villa with vaulted ceilings and open kitchen family room is very light, bright and inviting. The kitchen has newer cabinets and beautiful granite. There is tile flooring throughout the living area with carpet in both bedrooms. This villa has been on the short term rental market, but would also make a great second or permanent home. Easy maintenance with new HVAC and hot water heater and newer washing machine and dishwasher. Shipyard Plantation is a gated community that offers private beach access with golf and tennis available. Colonnade Club has its own pool and is a short distance to the beach. Desirable well managed Windward Village fee simple townhome with new roofs in 2017 located in the gated entry community of Shipyard. 2 BR 2 -+ BA property has an open floor plan & a screened porch overlooking fairway golf views. 1st floor offers 2 bedrooms with en-suite full baths, full-size laundry & large deck. 2nd floor has open living/dining/kitchen area & has vaulted ceilings & then also flows out to a great screened porch. There is a half bath on the second floor for convenience. Windward Village has one of the nicest pools, hot tub, fire pit, bike racks & playground. Long & short-term rentals & pets are allowed. Sold Fully Furnished. Fee simple townhome in highly desirable Windward Village. Conveniently located near the Pope Ave gate in Shipyard, this updated unit features quartz and glass subway tile in the kitchen, tiled baths with granite, vaulted greatroom and open floorplan, deck, & screened porch overlooking the golf course, as well as updated doors, hardware, and light fixtures. Renovation in 2011 included all new plumbing (no poly) and HVAC, and new Water Heater (2012). Service yard includes storage room. Windward Village boasts a beautiful pool, hot tub, fire pit, and bike racks. Newly painted, this is a beautiful and clean property! Regime Fee: $380. 9 The Cottages in Shipyard Plantation. MLS#392900. Totally remodeled with an exceptional view of lagoon to #3 fairway of Brigantine golf course. This 2 BR 2.5 BA townhouse is a great place to call home or as a vacation home with great rental income. Remodeled with all new flooring, paint, new kitchen and baths including granite counter tops and stainless steal appliances. Walk or bike ride to the beach. Shipyard offers 2 gated entrances for easy access with miles of bike paths leading you to Beach Club & private beach access, plus three 9 hole golf courses. Snowbirds....Are you tired of trying to find a winter rental? This 3 bedroom 3.5 bath villa with fireplace and screened porch is situated on a tranquil lagoon just 2 blocks to the beautiful Forest Beach. Spend every January February and March in your own 1800+ square foot townhome which is spacious enough to invite family and friends. Immaculate villas are in turn key condition at all times. Tennis and 2 pools on site. The central pool & restrooms will begin an upscale renovation in 2019 to include a new pool, paver decking with new furniture, new restroom facilities and brand new pavilion. Can be rented or traded for world wide destinations. Your place at the beach! This beach-oriented Quartershare is in Shipyard - one of Hilton HeadGÇÖs best plantations. The yearly fee includes everything from taxes, HOA fees, and insurances to maintenance and amenities! A great opportunity to own a vacation home/investment property for a fraction of the price. You own 13 rotating weeks of this villa which has a strong rental history. Several weeks in 2018 have already been rented! End unit, downstairs, two pools and tennis courts. Long awaited first-floor lagoon view 2 bedroom, 2 bath unit with rotating schedule. Start enjoying your two weeks out of every 8 all through the year. The views from this unit are amazing! One of the best ways to own your place at the beach!